I needed something big and green, and Nancy Tracy's Christmas Tree in size 10 thread fit the bill. It's a little lopsided since I didn't block it yet. Nancy generously shares a free pattern every month. 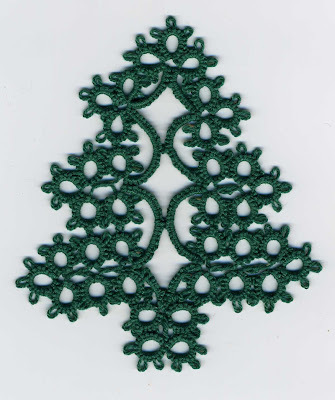 You can go to her site and sign up for the newletter, which will bring you patterns, recipes, and the current specials at her online tatting store. I'm usually not a fan of big thread, but I use it when the situation demands. After the size 10 tree, I went to the other extreme and rewound the shuttle with size 80 and made Mark Myer's Cat. So understated and elegant! This is almost 6 inches tall in size 30. In larger thread it could get huge! 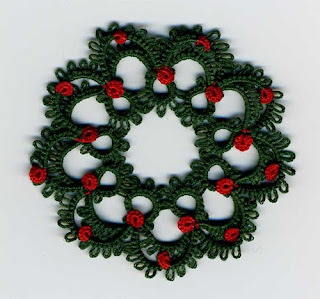 After finishing all those white snowflakes, I've been enjoying some holiday tatting in green and red. 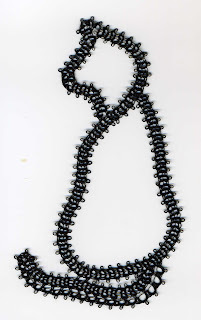 Here is Mark Myer's wonderful Holly & Berries design featuring the half ring braid technique. I love this technique; I love this pattern. here. According to my printout, I downloaded this from the web on 11/25/99 and only now, more than ten years later got around to making it. 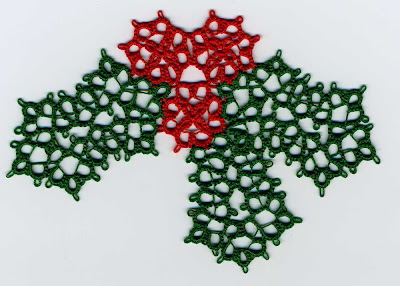 This is made in one pass with one green and one red shuttle, and features lots of Josephine knots. Just a quick post to show I'm still here. I've been working on snowflake bangles for small Christmas gifts. Most of these are Mike's excellent "Playing in the Snow-flake". I love the swirls and the fact it is quick and easy. Check out his blog for plenty of tatting-on-glass-balls eye candy. In the center is the Layered Tatted Snowflake from Nancy at Be-Stitched. 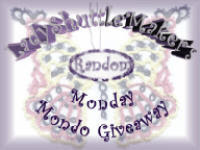 On her website you can find her online store for tatting supplies and a generous array of free tatting patterns. 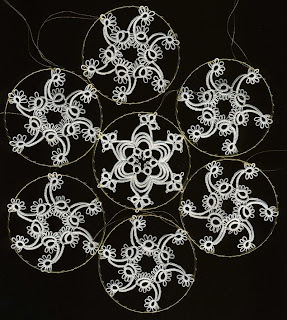 I will claim Nancy's snowflake as motif twelve. I used Mike's snowflake in a previous challenge, so it doesn't count this time.